Invitations are out! 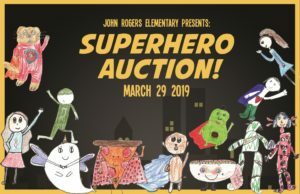 Extras are on the school bulletin board or you can buy tickets until March 16th and make donations at https://johnrogerspta.ejoinme.org/register2018. Share the love and send the auction link to friends and family who might like to contribute. Make a $25+ donation and receive a commemorative John Rogers cup (delivered via Kidmail). Calling all bakers! Please volunteer to make or procure a delicious dessert for the auction. Your sweets will help raise funds for John Rogers during the fun and fast-paced Dessert Dash. Cakes, tarts, pies, cookies, cupcakes, bars… anything goes! You can bake or buy a dessert. Your dessert should feed about 10 people. Desserts should not require refrigeration. If interested, please contact Oma at nedandoma@gmail.com or sign up on the school bulletin board. Stuff – Donate items to be auctioned off. Consider creating a Heritage Basket to share your family’s cultural background. Check with your room parent to see if your class’s auction project needs support. Wine – We still need bottles of wine! Your mad hosting skills – You can host an Otter Party! Host at your house, a pool, a community center, at the ice rink – wherever you can get people together for a good time. Parties can be for kids, families, or adults-only. Place an ad in the auction catalog. Have a business? Want to embarrass your kid with a funny family photo? 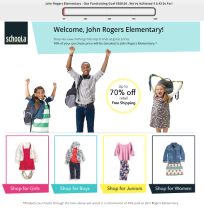 Place an ad or an acknowledgement in the catalog. See you on March 30th at the Auction!